For years I’ve been persuading my busy friends to occasionally make home-cooked food to nourish themselves. I know it’s hard – most of them are young professionals with no time, skills, or interest to cook. But learning to cook for yourself (even if once in a while) is very important. It makes you more aware of what you put into your body. If you’re busy chasing money, you really do need an exceptionally strong and healthy physique. So I simplified my Teriyaki Chicken recipe and make it in the Airfryer. Even if you don’t know how to turn on a stove, what more fry an egg, you can make this. It’s a matter of mixing a few seasonings into a bowl, and placing the chicken into the appliance. This recipe only took 5 mins hands-on time. Step 1 SALT CHICKEN. Rinse chicken. Pat dry with paper towels. Poke holes with a fork on the skin side. Rub chicken with a pinch of salt. 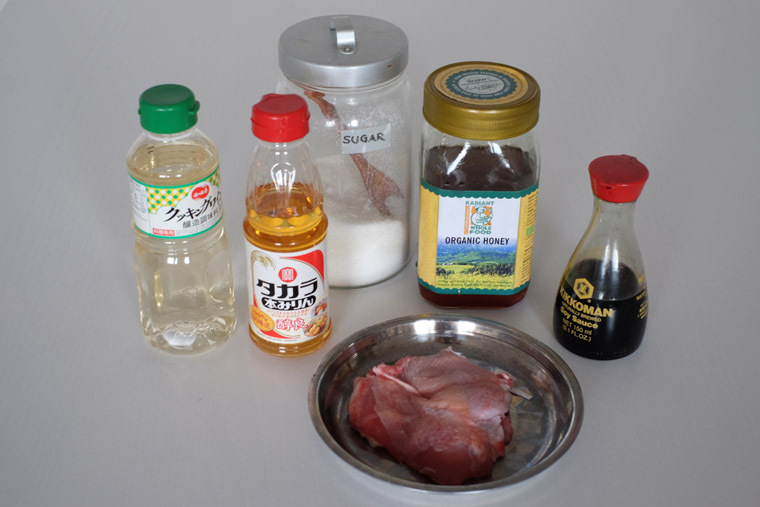 Step 2 MAKE TERIYAKI SAUCE: In small bowl, add ingredients to make teriyaki sauce. Step 3 FRY CHICKEN :Place the chicken skin down on the grill pan (not the basket one which wouldn’t crisp up the skin). Place it at a corner to make space for the bowl of sauce. Cook at 180°C for 5 minutes. Step 4 COOK SAUCE: Open the Airfryer drawer while it’s still cooking, and place the bowl of sauce inside. Push it back in and let it cook for another 10 min. Poke skin with fork & sprinkle 1/8 tsp of salt of 1 chicken thigh. Add in a bowl: 1 tbsp soy sauce + 1 tbsp mirin + 3/4 tbsp sugar + 3/4 tbsp sake + 3/4 tbsp honey. 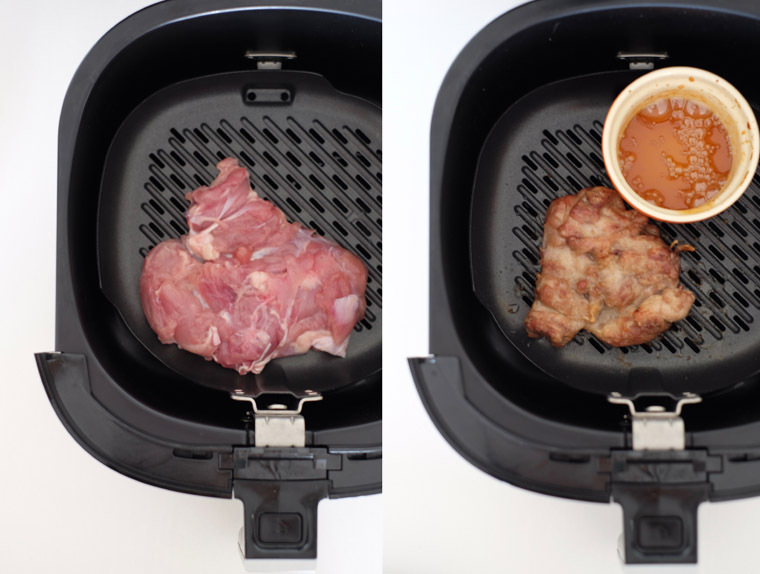 Place chicken skin-down on Airfryer grill pan. Set to cook @ 180°C for 5 min. After 5 min, put in bowl of teriyaki sauce to cook for another 10 min. Slice & serve. 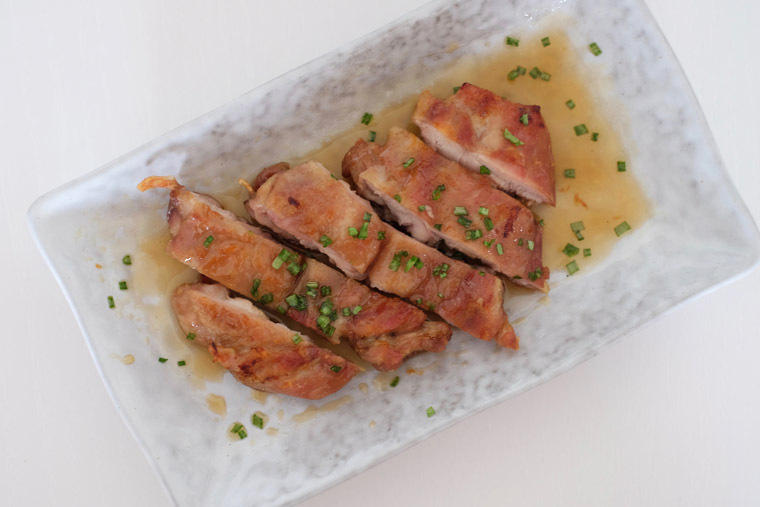 Crispy skin The original recipe marinate the chicken with sake for 10 minutes. However, to achieve the kind of crispy skin that I love, I omitted that step. I also make sure I pat dry the chicken and place the skin on the grill pan. Slice and garnish for better presentation. The dish looks so much better after you slice it and garnish with some spring onions. I like to cut it with a pair of sharp scissors, and pluck spring onions from my mini herb garden at home. But its totally optional. After all, I came up with this dish for people who have very little time, but would like to cook something simple at home. Using non-refined sugar. I try to limit the use of refined sugar in my cooking. I’m thinking to try using brown sugar or molasses. I believe it’ll taste good too. Fish. If you don’t like chicken, you can use fish instead (actually that is my preferred choice). Try mackerel or salmon. Non-stick pan. 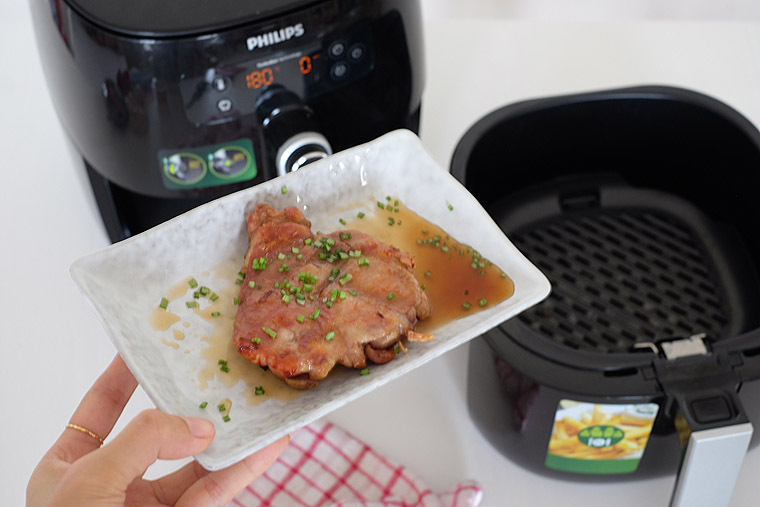 If you don’t have an Airfryer, you can still make this dish. I recommend that you use a non-stick pan.